Say what you will about Nintendo’s little purple lunchbox, the Gamecube, but it was home to many delightful experiences from Super Smash Bros. Melee to The Legend of Zelda: Twilight Princess. We now know it was also home to one of the very first Nintendo Wii remotes as well thanks to the recent listing from [Kuriaisu1122] on Yahoo Auctions. The prototype Wii remote is a wired design and features a proprietary Gamecube controller cable. Notable differences include the two buttons toward the bottom are labeled ‘B’ and ‘A’ respectively. This shows that Nintendo always intended to have players hold the remote sideways in order to play Virtual console games. The large white button next to the directional pad is unlabeled, and along the middle are the traditional ‘Start’ and ‘Select’ labels on either side of ‘Home’. However, these all would go through multiple revisions on the way to the final design. Interestingly there is an Ethernet jack at the base used to connect accessories. That connector would eventually become the often maligned “Nunchuk interface”, but what modder wouldn’t have loved it if that Ethernet port had carried on to the final design? Much like the “invaluable” Mario Party 6 microphone, the prototype’s IR sensor bar communicates via the Gamecube memory card port. The auction listing featured a photo size comparison of the prototype sensor bar is around four inches wider than the final design. Missing from the prototype Wii remote is the small tinny speaker, but that always seemed like an after thought anyway. Credence as to the controller’s validity was given in a tweet from WayForward’s James Montagna who said on Twitter, “Wow, it’s the prototype Wii Remote & Nunchuk! I remember seeing these back when it was still known as the Nintendo Revolution!”. Montagna would go on to post photos of the Wii remote from E3 2006 that featured ‘Back’ and ‘Pause’ buttons where the plus and minus buttons would ultimately reside on the final design. These photos of the missing links in the evolution of the Wii remote help fill in the design process at Nintendo. They also further the idea that Nintendo always wanted players to measure each of their new consoles’ processing power in “X number of Gamecubes duct taped together”. 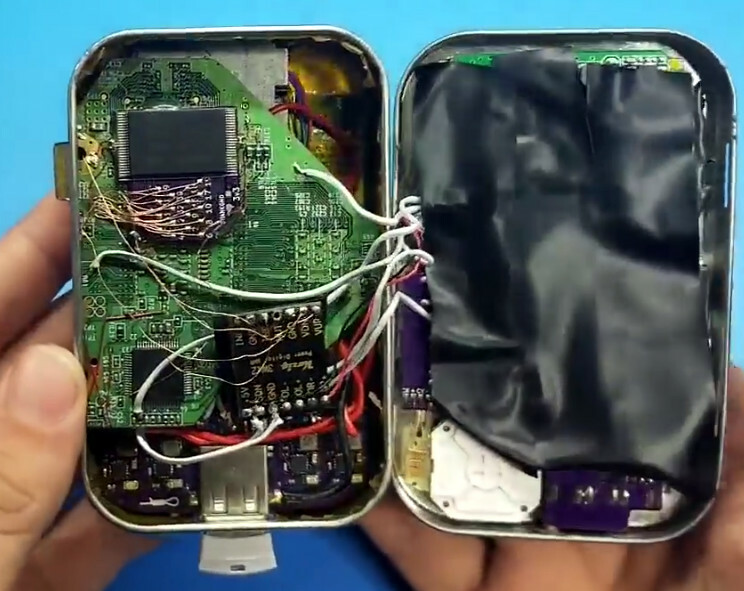 For more on the console formerly known as the Nintendo Revolution, check out this incredible Wii console mod in an Altoids tin featured on Hackaday. There are plenty of people out there who still enjoy playing games on vintage computers like the Commodore 64. But while they likely return to these classic games themselves out of a sense of nostalgia, the feeling doesn’t always extend to the hardware itself. For example, one can enjoy playing Impossible Mission without having to use a contemporary C64 joystick. Thanks to an open source project developed by [Robert Grasböck], C64 owners who want to take advantage of the improvements made to gaming controllers in the nearly 40 years since the system’s release now have another option. 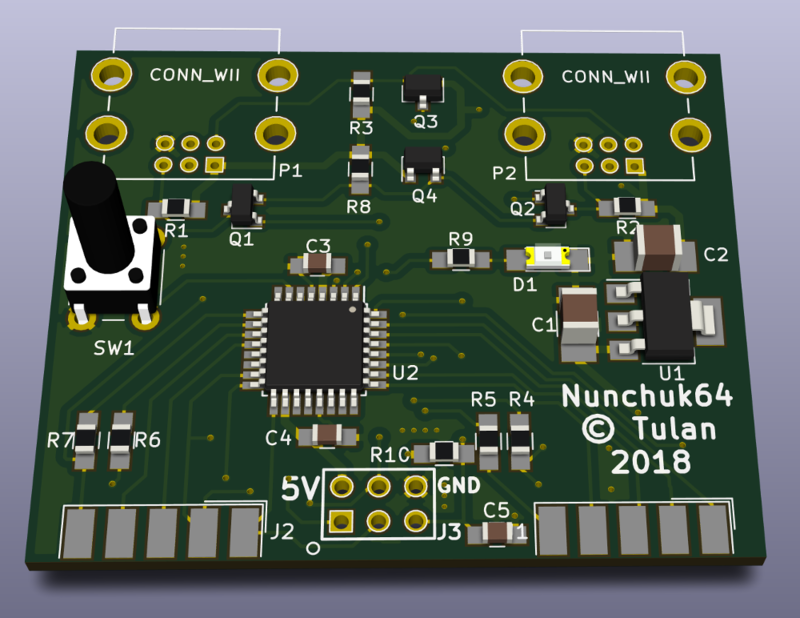 Called Nunchuk64, it allows you to use various Nintendo controllers which make use of the Wii “Nunchuk” interface on original C64 hardware. This includes the controllers from the recent “Classic Edition” NES and SNES systems, which offer a decidedly retro feel with all the benefits of modern technology and construction techniques. Both the hardware and software for Nunchuck64 are open source, and everything you need to build your own version is in the project’s repository. 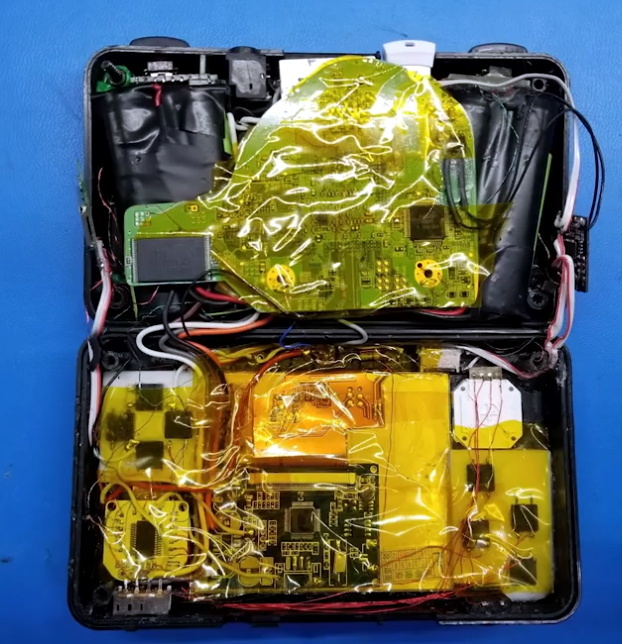 [Robert] even has assembly instructions, complete with images, which walk you through building your own copy of the hardware and flashing the firmware onto it. This is a nice touch that we very rarely see even in open source projects. The board is populated with a ATmega328P microcontroller and a handful of passive components, making assembly fairly straightforward assuming you are comfortable with SMD work. Bringing more modern controllers to classic systems seems to be gaining popularity recently, within the last few months we’ve seen Xbox 360 controllers on the Nintendo 64, and newly manufactured pads for the Atari 5200. How would you approach a build that required you to hack apart a perfectly good console motherboard? With aplomb and a strong finish. [jefflongo] from [BitBuilt.net] — a forum dedicated to making consoles portable — has finished just such a task, unveiling his version of a portable Wii to the world. While this bears the general appearance of a portable GameCube, it’s what inside that counts. 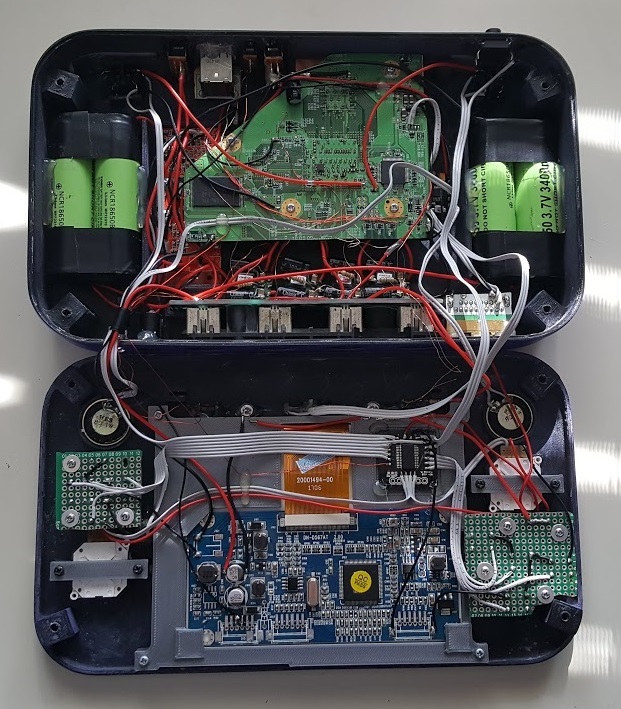 A heavily modified Wii motherboard — to reduce size — forms this portable’s backbone, and it includes two infrared LEDs on its faceplate for Wii Remotes. A single player can use the built-in controller, but [jefflongo] has included four GameCube controller ports for maximum multiplayer mayhem. Although he’ll likely plan on taking advantage of the built-in AV Out port to play on a TV and charge port for those extended gaming sessions, four 3400mAh batteries — with an estimated four hour battery life — should keep him satisfied on the go until he can recharge. While the electronics display an impressive amount of work, but the final piece is a sight to behold. Check out the demo video after the break! One of the modern marvels in our medical toolkit is ultrasound imaging. One of its drawbacks, however, is that it displays 2D images. How expensive do you think it would be to retrofit an ultrasound machine to produce 3D images? Try a $10 chip and pennies worth of plastic. While — of all things — playing the Wii with his son, [Joshua Broder, M.D], an emergency physician and associate professor of surgery at [Duke Health], realized he could port the Wii’s gyroscopic sensor to ultrasound technology. He did just that with the help of [Matt Morgan, Carl Herickhoff and Jeremy Dahl] from [Duke’s Pratt School of Engineering] and [Stanford University]. The team mounted the sensor onto the side of the probe with a 3D printed collar. This relays the orientation data to the computer running software that sutures the images together into a complete 3D image in near real-time, turning a $50,000 ultrasound machine into its $250,000 equivalent.